Diving into the world of orthodontics may be a new adventure for you. It’s exciting to start your journey to a beautiful smile. 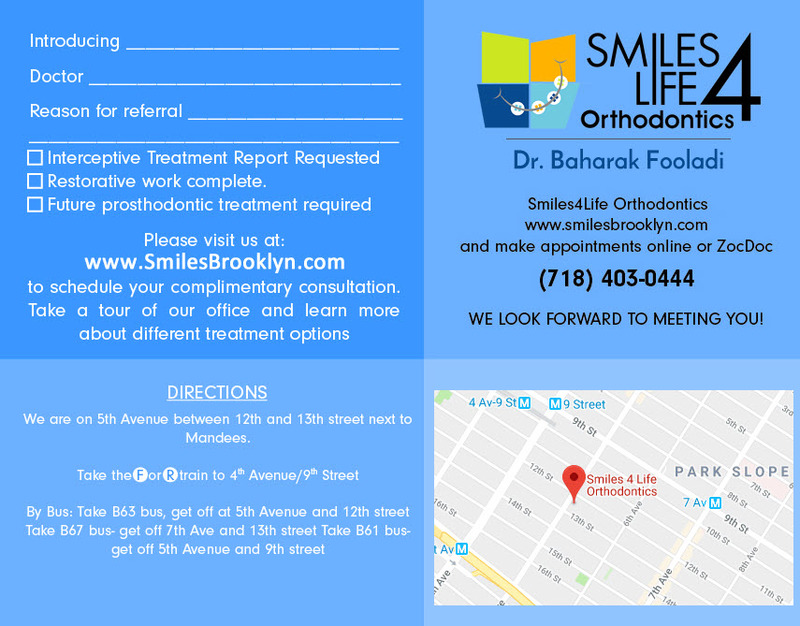 It’s normal to have lots of questions, but Dr. Baharak at Smiles For Life Orthodontics in Park Slope is here to answer all of them! Do you charge for the first visit? There is no charge for your first time to see Dr. Baharak to evaluate your orthodontic needs. Do I need a dentist’s referral? 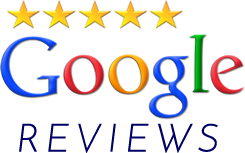 No referrals are needed for our complimentary consultations. Experts recommend bringing your child for an orthodontic evaluation by age 7. This gives you a picture of your child’s current and predicted conditions, and you’ll learn if any preventive work is advised now to lessen the extent of orthodontic treatment later. Dr. Baharak allows an hour and a half for the initial visit. This provides time for a thorough examination and impressions if needed. Do you accept transfer patients from out of town? 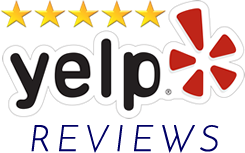 Patients transferring from another city are welcome at Smiles For Life Orthodontics. You’ll be considered a new patient, so full diagnostic records will be completed to determine your current condition and proposed treatment. No large down payment is required; instead a monthly fee will be assessed during treatment. A growing number of adults are seeking orthodontic care as advancements in technology make treatment more comfortable and convenient. An orthodontist is a general dentist who continued full-time training in orthodontics for at least 2 additional years, achieving a nationally accepted certificate in the specialty area of orthodontics. Orthodontists then focus exclusively on straightening teeth and dentofacial orthopedics. Do you offer appointments after school or late in the day? Certain procedures need to be performed during the hours of 9 and 3, but the majority of patients are able to schedule early and late appointments. Smiles For Life Orthodontics strives to work with your schedule and accommodate your needs. You can always contact our normal office phone numbers at any time, and if an emergency occurs outside of our business hours, information will be provided about how to contact the clinical assistant who is on call. Can we set up a payment plan? We will help you arrange a convenient payment plan so you can pay for services over time, typically coinciding with your treatment plan. A payment plan is possible whether or not you have insurance. Upon verification of coverage, we will bill and collect from your insurance carrier. If coverages changes or ceases, you will be responsible for the agreed-upon fee. All major credit cards are accepted by Smiles For Life Orthodontics. We can arrange direct debit, charge card posting, or internet payments. We do not charge our patients any interest. We provide special fees and programs for multiple patients within the same family. Phase 1 treatment is part of early intervention, which means that patients obtain treatment before all permanent teeth are in place. This enables Dr. Baharak to correct malocclusions that could be harder to treat later. This does not necessarily mean that no orthodontics will be required during adolescence, but it can make it less extensive. Some common treatments during Phase 1 are correcting tooth or jaw bite problems in which appearance, function or psychological concerns are noted. Phase 2 treatment is conventional orthodontic work that begins when the final baby teeth are lost and the 12-year molars have been assessed or straightened. Typical treatment time for Phase 2 lasts between 2 to 3 years. How do I know if Phase 1, Phase 2, or both are needed? Visiting Dr. Baharak by age 7 is the ideal way to learn if either treatment is needed. Roughly 10 to 20 percent of young patients receive advantages from Phase 1 treatment, and the remaining patients are placed in our growth and development program as they are monitored. Dose early intervention really work? Better results from early intervention aren’t promised in every case, so each patient is evaluated to see if early treatment will provide significant benefits. Some patients find early treatment very meaningful in their long-term goals, but it depends on each patient. Full treatment can typically occur in 2 years during active tooth movement. Sometimes treatment is divided into two or more time periods to accommodate Phase 1 and Phase 2 treatment. If I require pre-medication for dental visits, should I do that for the orthodontist also? Yes, if you benefit from medication to help make your dental visits successful, continue doing that for orthodontics as well. Basically, misaligned teeth are gradually shifted into better positions by using wires that are attached to brackets on the teeth. No, Dr. Baharak does not use recycled braces. Are retainers required after braces? Retainers play an important role after your braces are removed. They should be worn full-time for about a year, and then at night indefinitely. It’s a natural part of life for teeth to move, so retainers help ensure your orthodontic results stay the same for life. What about retainers that are glued behind teeth? Some patients have retainers bonded to the back of lower teeth. Careful dental hygiene is necessary as well as regular dental checkups to monitor this kind of retainer. Should wisdom teeth be removed? Wisdom teeth, or your third molars, may cause gum issues, swelling if they are impacted, or infection related to food trapped below the gums. Scheduling wisdom teeth removal if recommended by Dr. Baharak is a preferred choice rather than removing them under emergency conditions. Oral surgeons recommend removal when two-thirds or so of the root has formed. Sometime after the ages of 16 to 18 is the average time for removal. Can orthodontic treatment treat or cause TMJ problems? There is no proven link between orthodontic care and TMJ disorder. Issues related to TMJ can occur (or not) in all kinds of good or bad bites. 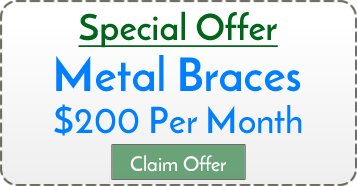 Are there health benefits from wearing braces? Orthodontics helps improve the comfort of your bite, making it simpler to perform dental hygiene tasks that promote good oral health. Orthodontics also can improve your facial musculature, resulting in higher self-esteem. Do enlarged adenoids and allergies affect braces? Mouth breathing due to enlarged tonsils, adenoids, or allergies can cause your upper and lower jaw to grow further apart and elongate your facial shape during growth. This may result in teeth crowding or narrow arches. Does tongue thrust or low tongue posture affect braces? Similar to the effects of enlarged adenoids, the pressure from your tongue thrusting onto your front teeth can worsen teeth protrusion or spacing issues.